Even with the best intentions, sometimes among major players who should know better, cause marketing can go terribly wrong. The mantra of cause marketing, indeed of all cross-sector partnerships, is that the partners need to be well aligned. Their missions, their products or services and how they present their campaign to the public must make sense as a partnership. The public becomes skeptical when they smell or taste that the campaign is purely done to make money. Here are some bloopers. Recognizing the ubiquitous problem that many of our roads and highways have fallen into disrepair, KFC thought that it would be a good idea if they teamed up with several cities around the country and filled in those cities’ potholes. So the public would know who was making this generous donation, KFC painted their bright white logo on top of the freshly laid asphalt. 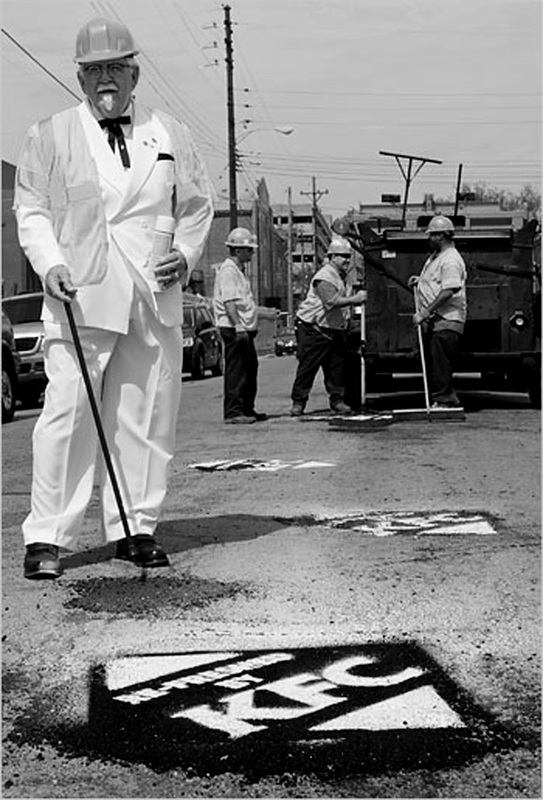 As you see in this promotional photograph, “The Colonel” is pointing his cane at a recently paved, logo-covered pothole. I hate to pick on KFC, but if the bucket fits. After the above-described campaign, they developed a partnership with Susan G. Komen for the Cure and produced a second highly-questionable campaign where they really stuck their wing in it. 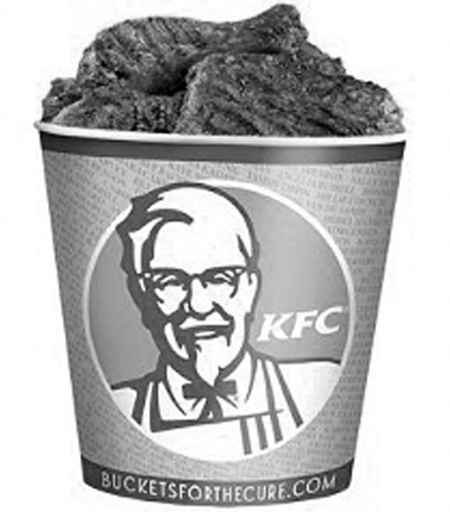 KFC and Susan G. Komen for the Cure launched a campaign in which they printed pink KFC buckets with the breast cancer ribbon and then handed their customers the bucket full of fried chicken wings, legs and breasts. $.50 of the sale of each bucket went to the charity. What were they thinking? A respected nonprofit organization dedicated to education and research about breast cancer promoting deep-fried food, in pink buckets. What was this campaign really all about? Yes, money. KFC donated more than $4.2 Million to Susan G. Komen for the Cure, the largest single donation in organization’s history. Roger Eaton, President of KFC Corporation said, “This was a campaign that allowed our customers to fill up their stomachs and their hearts at the same time.” Needless to say, this campaign caused a media and consumer controversy which, if only briefly, damaged the credibility of Susan G. Komen… but it made lots of money. The investor extraordinaire, Warren Buffett, once said, “It takes 20 years to build a reputation and five minutes to ruin it.” There is nothing worth the risk of destroying a hard-earned reputation. •	Do absolutely nothing that will hurt your brand. Good reputations are hard to gain and much harder to regain if lost. •	Never be just about the money; greed is ugly and hard to hide. •	Always put the cause first, which will gain attention, loyalty and finally, financial success. •	Attracts media attention…for free! Please visit http://www.bruceburtch.com for more information and to view Win-Win for the Greater Good. Cause marketing is a specialized subset of cross-sector partnerships, and like all cross-sector partnerships, cause marketing is a partnership between two or more sectors. Though in cause marketing, the partnership is primarily between nonprofit and for-profit organizations and is primarily about marketing, sales, fund development and increasing brand awareness. Cause marketing has grown by leaps and bounds, and in 2013 an estimated $1.78 billion was spent in North America alone on cause marketing campaigns. 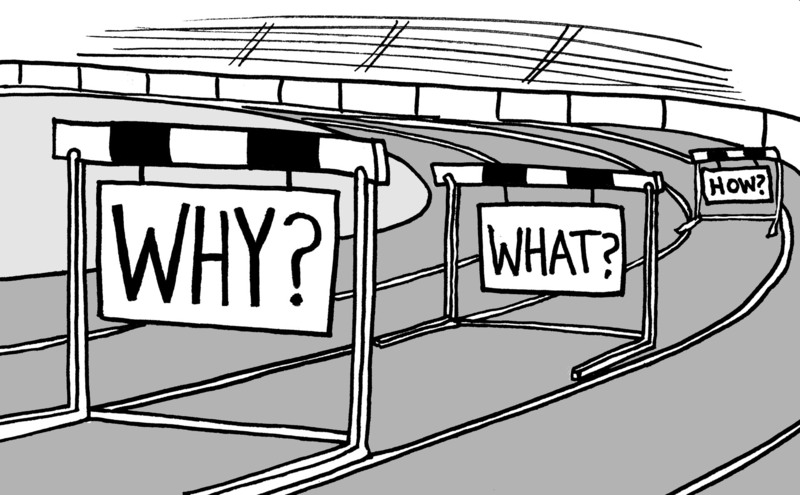 Cause marketing is a marketing campaign with specific strategic goals and objectives. It is not an event, sponsorship or one-time project and certainly not philanthropy. You will find as we explore further into this area that a well-strategized and well-developed cause marketing campaign will bring you many of the benefits we have discussed in cross-sector partnerships. Cause marketing is a partnership between two or more nonprofit and for-profit organizations whereby each party receives benefit toward their individual marketing objectives, while striving through their combined resources to create a greater good. Let’s break this definition down to see why this particular description is a bit more comprehensive, and possibly more demanding among others available, yet touches upon the foundational elements of highly successful cause marketing campaigns. Partnership: Going into the partnership, both sides should come together as equals. This equality is necessary for a fair, trusting and successful working partnership. Without this trust, without this focus on true partnership, your campaign is dead in the water before it’s launched. Two or more: In most cases, a cause marketing partnership is between two partners, but as we have seen, sometimes partnerships can have three and even four sectors involved. 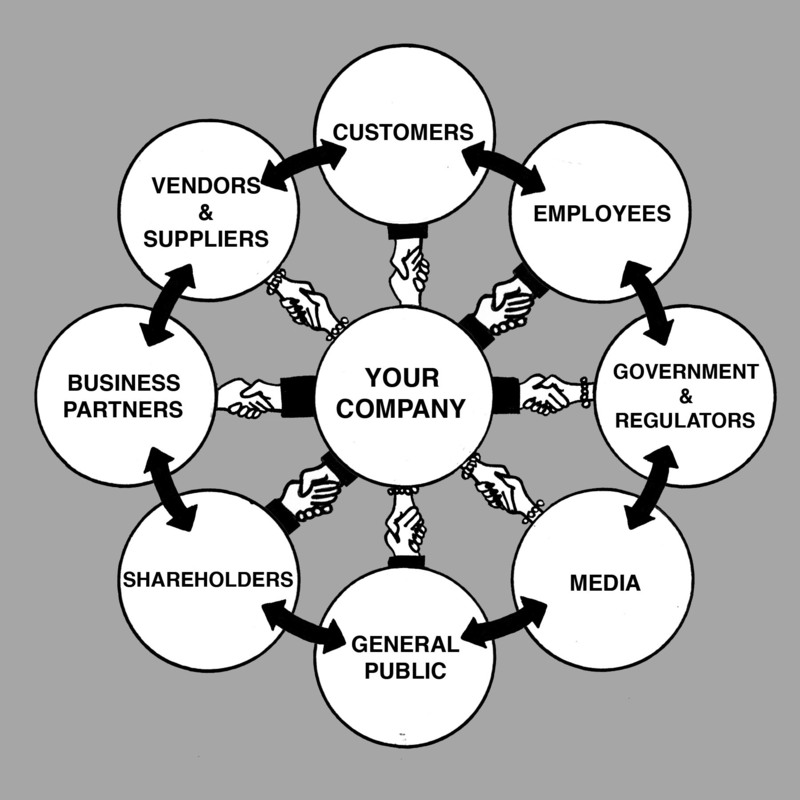 And sometimes, even multiple partners within sectors. Bringing multiple partners together can leverage the success of the marketing objectives. So don’t limit your partner opportunity thinking. More may be better, or maybe not, based on your marketing strategy and campaign needs. Individual marketing objectives: All sides may be approaching this partnership with very different marketing objectives and internal agendas. This is to be expected. Having clear communication and understanding about these separate agendas and objectives and then working toward the benefit of all partners will greatly enhance the overall success of your cause marketing campaign. Combined resources: Possibly more than in any other marketing or promotional endeavor, the successful execution of your cause marketing strategy and resulting campaign creates a whole far greater than the sum of its individual parts. You just can’t possibly accomplish alone what you can do working together for your mutual success. This is the greater good. You can address any nonprofit’s cause, but to be optimally successful, you must focus on who or what will benefit from your effort. Nonprofits as such are not causes in and of themselves, but facilitators that bring much-needed services and support to the cause, which of course, is the people, environment or social issues themselves…the greater good. As we discussed in the last blog, nonprofits can receive 31 distinct benefits by working in partnership with for-profit organizations, and the number keeps growing. And for-profit organizations can receive 38 distinct benefits in such cross-sector partnerships. Now that’s a heck of a lot of benefits, and far more than most people would ever imagine. Let me list just the top 10 benefits here and the complete listing of all 69 benefits can be found in the free Resource Center at http://www.bruceburtch.com. Note: These are not in any particular order, other than increasing sales, which is nearly always noted as number one. Nonprofits are right behind with the potential to have at least the 31 benefits – those we have discovered so far. Here are the top 10 benefits nonprofits can receive. By The Way: Which Provides More Value: Money or Brains? When considering a cross-sector partnership, not surprisingly, the first topic that seems to arise is money. How much should the nonprofit ask for or how much should the for-profit consider donating? While money usually enters the conversation at some point in a partnership discussion, it’s short-sighted to think that money is the only or even the best value to receive in a partnership. Quite simply: If you focus on money you may leave a lot of money/value/assets on the table, never to be seen again. Here is the underlying secret to success of cross-sector partnerships: first seek brains…and the money will follow. From my experience, most people and the organizations they represent begin their exploration of a partnership with a fairly limited list of partnership goals. Usually the “ask” is fairly simple and straightforward. The nonprofit might approach a for-profit organization for a donation to a particular project or program, or to sponsor a table at their annual fundraising gala. The for-profit organization may be seeking to raise the morale of its employees by arranging a one-day event where the employees would volunteer at a local homeless dining room or shelter. The misconception here is that cross-sector partnerships are not about philanthropy, cash donations, “one day and done” volunteer events, or sponsorships such as a breast cancer 3-day event or pledge walk. By definition, a partnership is a relationship. Many times there are contractual stipulations, but in nearly all cases, the partnership is based on a relationship meant to be long-term, jointly beneficial with many linkages. In my workshops, participants are asked to write down all the benefits they think a nonprofit organization can receive by working with a for-profit organization in a partnership. Then we flip the exercise around, and they write down all the benefits they think a for-profit organization can receive by working in partnership with a nonprofit organization. And what I have found is startling. To the question of how many distinct benefits a nonprofit can receive from partnering with a for-profit organization, the answer is, at least as of this writing: 31 distinct benefits. And to the question of how many benefits a for-profit organization can receive in a partnership with a nonprofit organization: 38 distinct benefits. That is one heck of a lot of benefits for each partner to receive in a partnership. However, what surprises my workshop attendees the most is the fact that for-profit organizations can potentially receive more benefit than can nonprofits. Most people think it would be the other way around. An innovative public relations program, the most clever social media campaign, the funniest or most emotional advertisement, the deepest discount or the biggest sale, the largest benefit race or the most successful fundraising gala – none of these can come even close to the multiple benefits that come from a cross-sector partnership. Rather than detail all 31 nonprofit benefits and the 38 for-profit benefits here, in the next part I’m going to list the 10 most important ones, at least in my opinion, from each category. The complete listing of all 69 benefits can be found in the free online Resource Center at http://www.bruceburtch.com. By the way, you may be able to add even more benefits for either list, and I ask you to email me personally with your discoveries. Leadership San Francisco is a year-long program sponsored by the San Francisco Chamber of Commerce that promotes civic engagement, made up of participants from the nonprofit, for-profit, education and government sectors. Our forty-member class spent a day experiencing the crime-ridden San Francisco district known as The Tenderloin. 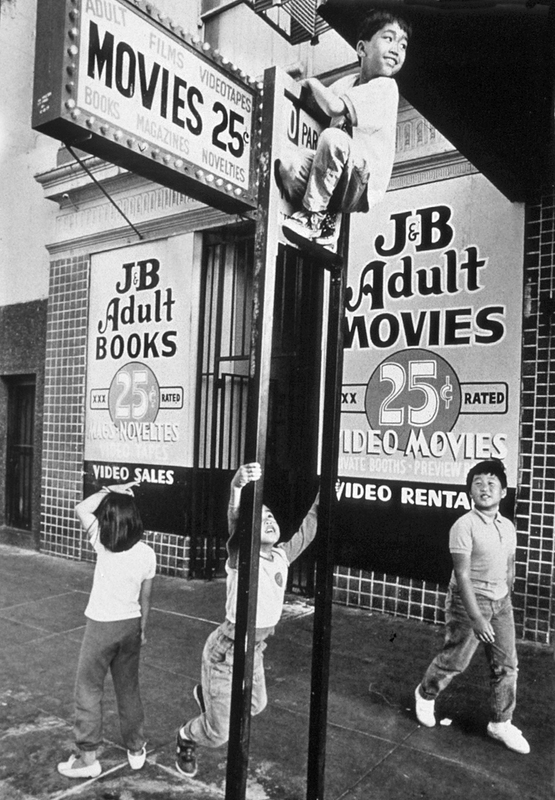 Besides the proliferation of adult bookstores, strip clubs, bars and a significant amount of homeless people milling around the filthy streets, what struck us was the number of young children we saw using these streets, sidewalks and storefronts as their playground. I proposed to our class that we take over Connie’s Bar and turn it into a free educational, recreational and cultural center for the children of The Tenderloin. It was an idea so large and so ripe with challenge that it took nearly 5 meetings for our class to agree that we just had to do this. As the loudest proponent of this outrageous idea, I was chosen to spearhead the endeavor. First we formed a partnership between Leadership San Francisco and TNDC. Seeking a prominent leader of the San Francisco business community, we enticed Holger Gantz, general manager of the Hilton Hotel and Towers, which bordered upon The Tenderloin to join our partnership. Holger enthusiastically led the fundraising drive which attracted Pacific Telesis, Koret Foundation, Gap, Bank of America, Wells Fargo Bank, PG&E and many others. Additional members of the hospitality and construction industries and members of the general community rushed to join the effort. Together we did what no one thought was possible – in one year we raised over $200,000, secured the lease on Connie’s Bar, completely renovated the space, built a small children’s library, computer room, director’s office and play room. On July 13, 1993 the Tenderloin After-School Program opened. And today, rather than using peep show signs as their jungle gym, the children of the Tenderloin have a clean, safe place to go after school. That’s the very great news. Perhaps the biggest challenge for this project was bringing together a highly diverse partnership team. The Tenderloin Neighborhood Development Corporation owned the building that housed Connie’s Bar but was unable to provide further financial support. The Leadership San Francisco class of 1992 was a small volunteer group of young men and women who could work hard but who also lacked the financial wherewithal to undertake such a costly project. The low-income community surrounding the proposed after-school program strongly favored the opportunity to provide a safe, off-the-streets place for their children, but could not financially support the project. 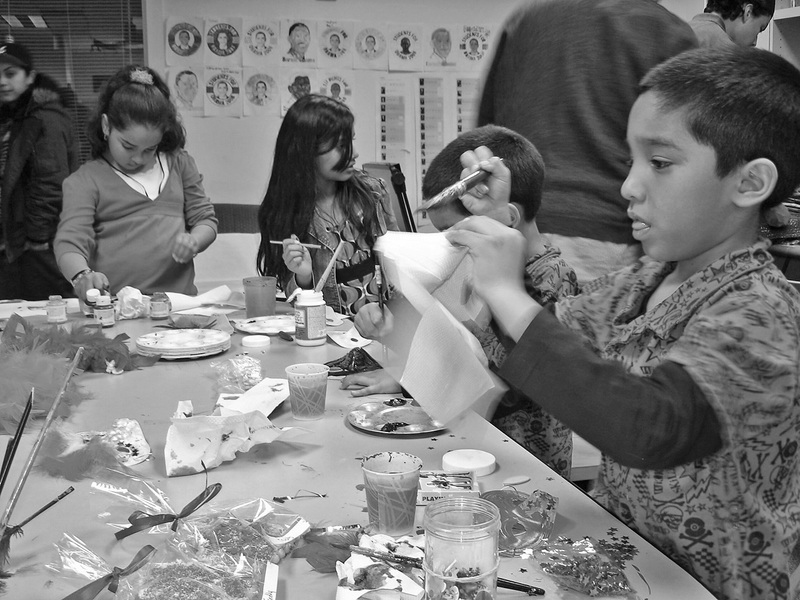 The challenges of the Tenderloin After-School Program point out that there are often distinct differences between the business practices, philosophy and personalities of each person and each sector. Indeed, organizations and individuals coming together will have personal agendas that they bring to the partnership. These personal agendas can sometimes be negative. However, in most cases, addressing and respecting individual agendas and objectives can be quite positive for the partnership. Please visit http://www.bruceburtch.com for more information.